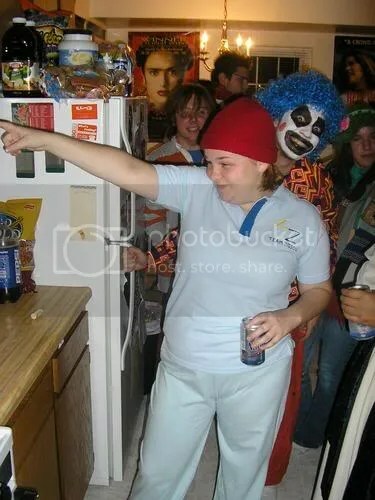 Lots of compliments on the Team Zissou costume. I hate Alex when he’s Biff the Clown, it’s too scary. Beth is the cutest homeless woman ever. Steve in blackface is hysterical. Kyle rocks as hard, if not harder than Billy Idol. Last night was pretty fun. There are very few things that I enjoy more than getting messages like that on my computer from Seth. Damn straight getting that “i love you” part right. Marie and I finalized our Halloween costumes yesterday. 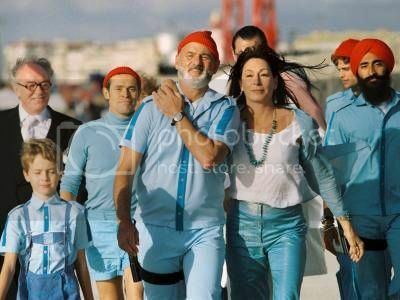 I am going as a member from Team Zissou, she is going as a roller disco champ. Both of our costumes rock pretty hard. Meg is going as one of the senior girls from Dazed and Confused, and Candice is going as Axl Rose….or as me. We are all going to look so cool that we will be dripping with new friends. Last night around 2A, I checked my mail, and found a package slip. Not having ordered anything recently, I got very excited, wondering what the mysterious package help. I begged Ellee to let me get my package (apparently the rules are that you can’t get them between 12midnight and 7A). I saw the address, and wrecked my brain for who lived on Spindlehill Road, and then all of the sudden it hit me: Miss Rider. My former Girl Scout leader. Now, you may want to know this to understand the hilarity of this situation: Miss Rider’s husband begged me for ideas for a gift for their first anniversary. Being the idiotass that I am, I told him to buy her a Bedazzler. Being a bigger idiotass than I, Dennis bought her one. And that is it. That’s how I ruined my Girl Scout leader’s first wedding anniversary. Anyway, in the package was the most beautiful bedazzled denim jacket, along with a bedazzled pair of skanky underwear. I miss Scouts. Bathroom radio news: Marie is now on my side. When we are in the bathroom together, brushing our teeth, washing our faces, or just using the toliet, we make sure to turn it to the oldies station. I don’t feel so alone in my struggles now. And I need a costume. I was going to be an 80’s prom queen, and wear The Dress, but stupid Amy has The Dress at home, and she doesn’t know where it is. Marie was going to do my hair and makeup, and I was going to have a shash, a crown, and everything. (The Dress is pictured to the left, being worn by Marie, my hair and makeup artist (and room mate)). I was also thinking that I could possibly be a member of Team Zissou. But I don’t know if people would get it. All I would need to find is some light blue sweatpants and a red stocking cap. I could pull that one off pretty easily. Plus, I could layer in the very likely case that it will be cold outside. Either way, I hope to have fun this weekend. Last year on Halloween I went home and saw Schoolhouse Rock at Town Hall. It was pretty fun. how can i embarrass myself? let me count the ways. I’ve fallen on that ramp three times now. 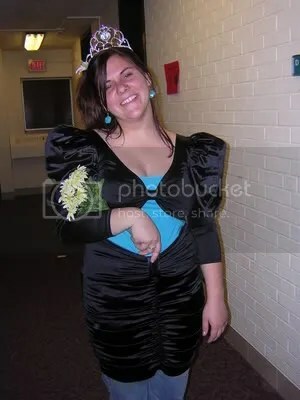 I may be the most embarassing person ever. sarah is old. so is meg. Bathroom Radio news: Someone changed the station, just short of the 48 hour mark. After interviewing other people on the floor (okay, my room mate) I have found that I am not the only one who would rather listen to “Help” by The Beatles than something by the Pussycat Dolls. Sarah’s birthday is today. I made her a mix CD and slipped it in the mail last night. It flows rather well, and there is only two awkward (in my opinion) spots on it. I’m pretty proud. Amy is going to Chicago this weekend, I am super duper jealous. However, Mavis, Dad, and Merek are coming up this weekend for BGSU Family Weekend. Woo. I think the part I’m most looking forward to is a trip to Meijer when I get some more shampoo, because I’m almost out. Yesterday was Meg’s birthday. 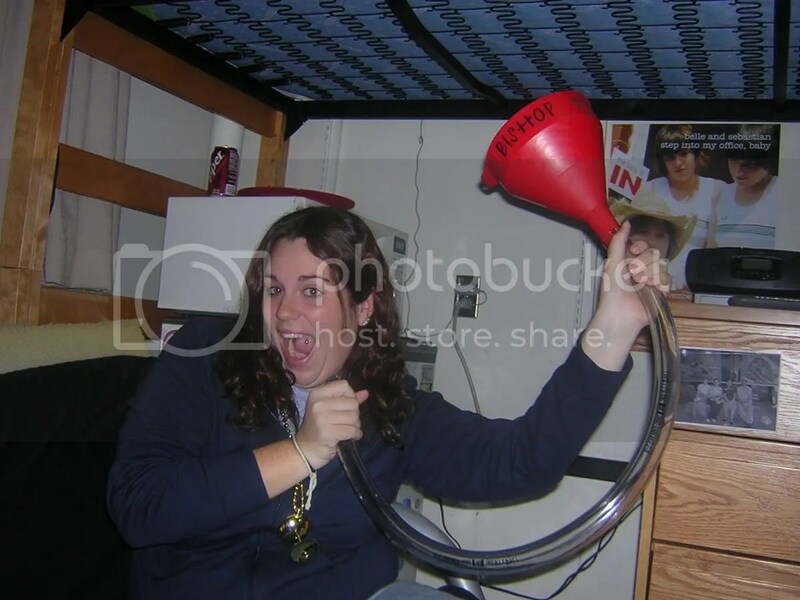 Marie, Candice and I went downtown to Ace Hardware last night and bought supplies to make a rootbeer bong. Yes, rootbeer. We also went to Ben Franklin Crafts, where a Mardi-gras necklace with a chalice attached was purchased. I also got some brads in the event of me ever finishing a script. News on the bathroom radio situation: Monday night around midnight, I turned the knob to the oldies station. As of now, it is still on. I’ve had 36 hours of being able to go to the bathroom without having to worry about hearing “My Humps” by Black Eyed Peas. I have not, however, been free of hearing it while walking down the hall. That’s a battle I just can’t win. I made a scene in VCT yesterday. Gene Poor (our cult leader professor) started talking about Dog the Bounty Hunter. He asked if anyone had seen it, and not realizing it, I halfway stood up and raised my hand. I think the unexpected enthusiasm surprised Poor, and he asked me who my favorite character was. Not remembering I was in a lecture hall, I yelled out “BETH! BETH IS A PIECE OF TRASH AND I LOVE HER!” By this point, half of the hall was turned around and staring at me. Gene said something else about how she goes on the bounty hunts as well, and once again, not thinking, I yelled out “AND SHE DOES IT IN FOUR INCH HEELS!” This time, the entire class was staring at me. I proceeded to talk, very loud, about how much I love this show. I don’t even realize it when I start a ruckus. I’m so embarassing. Don’t get me wrong. I love music. 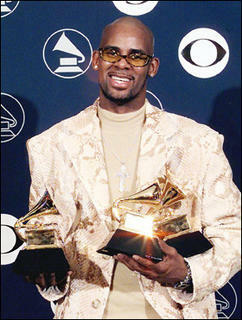 I will even go as far to say that I really enjoy a lot of pop music. “Since U Been Gone” by Kelly Clarkson? Yes. I like that song a lot. But lately the radio in the bathroom has really been getting to me. For one, I am sitting in my room right now, halfway down the hall from the bathroom, and I can clearly hear the Nickleback song being played. The volume of the music coming from that little plastic box is deafening. There is nothing that I want less than some offensive rock band’s (not unlike Nickleback) music slaping me in the face when I go to brush my teeth at night. “Remix of Ignition” by R. Kelly. Forgive me if I’m mistaken, but wasn’t this song a hit in the winter of 2002? Yes, I believe it was. Because a kid in my videogrpahy class did a music video to it. To remedy this situation, I have tried several things. First off, I tried ignoring it. This worked for about a day. Soon I realized that I knew every word to Ryan Cabera’s “Shine On.” The next temporary fix was to simply turn the radio down to a more ear-friendly volume. However, I could still hear the music. Next I tired simply switching the station. At first, this worked quite well for me, as long as no one was around, because I did not want people to know that I was the person changing their beloved homogonized radio sludge to WBGU, a student run station that plays everything from metal to folk. I could tell that WBGU was not well excepted by the girls on second floor Rodgers, because soon after I left the bathroom, I would hear song poorly composed pop punk song. Next I tired switching it to the oldies station, which had longer staying power, but was also not popular, and changed within a few hours. One night around midnight, I was brushing my teeth with Meg, and I decided to once again, take this into my own hands. Reluntantly, I turned the dial to 101.5 WRVF The River, Toledo’s soft rock station. Meg and I laughed as we danced around lip syncing into our toothbrushes to the cheesy easy listening song. I went to bed that night, and when I woke up for my 8:30 fiction class, the station was still on. A mixture of pleasure and horror (that station is really bad.) rushed over me. Throughout the day, I would stop by the bathroom to check out if The River was still playing, and to my surprise, it still was. No one changed the radio for two days. I think it’s safe to say that Josh Groban’s “You Raise Me Up” was played 1464 times in our bathroom over those 48 hours, and yet, I was happy. I felt calm. A peace came over me, and for those two days, going to the bathroom was not a punishment of any sort. This nirvana (besides the fact that I had to listen to the less-offensive WRVF) was short lived, and someone (I have my suspicions) changed the station.